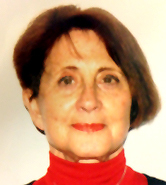 Arlette is a true Parisian raised and educated in Paris, born into an assimilated French-Jewish family. Her grandfather's first cousin, Louis-Germain Levy was actually the first reformed Rabbi in Paris. At the end of December 1942, her parents, Fernand and Renee Levy, and 4 year old Arlette were arrested in their apartment by two French Nazis. Arlette's father was able to bribe the two men. They let her go with the maid to her grandparents. This saved her life. Her parents were taken to the concentration camp of Drancy, a suburb of Paris, and then deported to Auschwitz where they were put to death in February 1943. Arlette came to America to marry her late husband, William Baker. She enrolled at NYU and obtained graduate degrees in French and classical Latin, subjects she taught in Chappaqua. She is now retired. 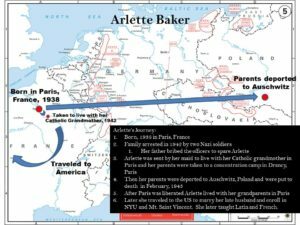 In addition to the USA, Arlette lives in Canada and in France. Arlette is active in her temple, in Social Action and Caring Community Committees. She was for several years the chair of the Holocaust Remembrance Committee at her synagogue. She spearheaded the installation of a Holocaust Memorial on the grounds of Temple Shaaray Tefila in Bedford, NY. She lectures and translates documents on the Holocaust.